The commercial availability of CubeSat components with flight heritage makes it possible to perform verification activity for space instruments in orbit. The J³ mission aims to test the performance and reliability of several radiation detectors for the Particle Environment Package (PEP) for ESA’s Jupiter Icy Moon Explorer (JUICE) mission. Unlike in conventional mission design, where most parameters can be varied continuously, the use of already available components for CubeSats restricts the possible design decisions that can be made. On the other hand this also enables to perform trade-offs on the mission level utilizing the complete discrete option space. The paper will describe this design process of selecting mission and spacecraft configurations based on their impact on the science output predicted by simulation. 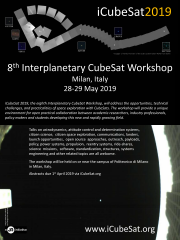 To achieve this, multiple variable parameters of a CubeSat system are considered and simulated to determine their impact on the instrument activity profile. These profiles are then related with the measurement characteristics determined from radiation simulations of the relativistic electrons in the Earth’s magnetic field. This method makes a rapid mission design within the tight time schedule of instrument development and verification feasible. The techniques presented here provide a guideline for other CubeSat missions which are aiming to optimize their scientific return.